The focus of this study has been, for the most part, focused on theater-released sci-fi movies. TV movies and programs are normally outside of the scope. The Love War (TLW) gets an exemption some readers of this blog were asking about it. TLW aired on March 10th of 1970, as one of ABC's "Movie of the Week" series. It starred notable TV actors. The venerable Lloyd Bridges, Angie Dickenson and Daniel Travanti. TLW did not get a theatrical release, hence the VHS box art in lieu of a poster. Made-for-TV movies were becoming the new realm of B-movies. Lloyd Bridges is an alien from the planet Argos. He has assumed the appearance of a human, and the name Kyle. His palm device beeps, denoting the presence of an enemy attempting to break the rules and ambush him. Kyle pursues this enemy through Los Angeles' Union Station, finally killing him out back. Kyle puts a small disk on the dead alien, causing him to glow green, then burst into flames. Kyle leaves, but has missed the last train. So Kyle takes a bus to Piru (pie-roo). A cohort of the killed alien also drives to Piru. Along the way, Angie Dickenson gets on the bus. Sandy makes lots of small talk with Kyle, even getting flirty. Kyle gets off at Piru. Sandy decides to get off too. He goes to a quaint local inn for a room. Sandy tags along and invites herself to share a room with him. Being new to humanity, Kyle seems okay with all this. In the room, he confesses to Sandy that he's an alien from the planet Argos. They are at war with the Zynons over the earth. They've civilized war to be a contest between two teams of three. They can tell aliens from humans with special glasses. Last alien standing gets claim to Earth. If Argos wins, all will be peace and brotherhood. If Zynon wins, Kyle says, they'll wipe out mankind and move in Zynons. The Zynons often break the rules (such as the ambush attempt). The showdown is to take place at noon, in the town of Piru. The other contestants arrive and start shooting their little invisible-ray pistols at each other. Battle battle. Chase chase. They all end up in a western ghost town. Sandy tries to get Kyle to give it all up and run away with her. He is duty bound to fight it out, but confesses feelings for her. Kyle finally kills the last Zynon in a western duel. He returns to Sandy. She shoots him with a ray gun, because she was actually a Zynon all along. While he slowly dies, they chat about feelings, etc. He dies. She walks off into the sunset. The End. For a low-budget film, the story has some depth. In many ways, TLW has a 50s B-movie look and feel, so it gets some nostalgia points. Despite the layered backstory of aliens, the story could be (and in many cases WAS) a rehash of classic western showdown films like High Noon. Kyle tells the backstory of how his planet had gone through their horrible nuclear war phase and how it disfigured them all. Note the contrast of good-guys (the West) and bad guys (the Communists), in how the Argosians would be benevolent if they won, where the Zynons would commit genocide and occupy earth if they won. B Familiar -- Aliens disguised as humans is a very old budget-saver from the olden days. Except for a few very modest props (ray gun, detector disk, etc.) there's nothing to tell you of alien technology. Handily enough, the ray is invisible, so money was saved on special effects too. Silly Title? -- "Love" must have been the marketing buzzword of the day. TV had its series, "Love American Style." The movie Love Story came out in 1970 as well. Perhaps the marketing department came up with a title that they figured would sell, and it was up to the producers to find a script that would fit it -- more or less. Actually, given how Sandy uses "love" as a weapon (charm one of the contestants to drop out of the war) does somewhat justify the title. Given how earth did not get occupied by the Zynons, despite Sandy's "victory," it would appear that Zynon cheating meant the contest was a draw and Earth was left alone. Piru-Mania -- Much of the action takes place in the little town of Piru, California, which actually does exist. It was used in other movies too, as a handy typical small town. It is actually only a few miles north of Los Angeles. The bus ride segments suggest that was a long ride away. Once in Piru, filming took place in and around the Heritage Valley Inn: a popular filming location. Piru has been a popular film location from 1910, Ramona, starring Mary Pickford, to 2005 and The Amateurs, starring Jeff Bridges. Actor Bits -- Lloyd Bridges was very well known in 1970, with several TV series through the 60s. Sci-fi fans will recall that he starred in an early sci-fi: Rocketship X-M back in 1950. Angie Dickenson went on to greater fame as "Police Woman". Daniel Travanti plays the lead Zynon. He would be more famous as Captain Captain Frank Furillo in "Hill Street Blues." A curious "extra" is Judy Jordan. She's the perky information girl at the train station. She got some unnecessary speaking lines, some close ups and a medium shot showing off her amplitude in a tight red sweater and pointy bra. Such exposure was typical for starlets trying to get "seen." Judy did not go on to much as an actress. Bottom line? TLW is a very low-budget production, which has a nostalgic quality. The "alien" aspect is minimal: a pair of cool glasses, a ray gun, a blinking disk. The story is more of a drama about a loveless soldier being seduced by a spy to abandon his mission. I remember this movie very well. It always surprised me how many "Movie of the Week" involved Sci-Fi or horror! 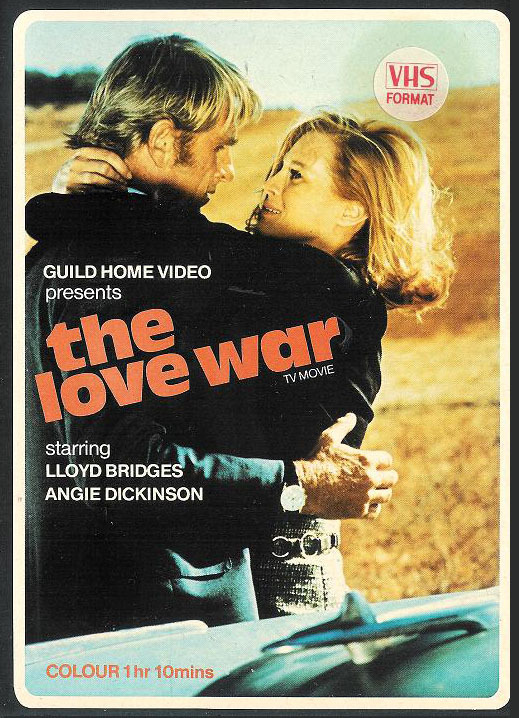 I haven't seen The Love War since, I guess, that TV showing in 1970. It struck some sort of chord with that young pre-teen, because it has been an example in my mind ever since of how SF doesn't need razzle-dazzle effects or makeup. The words/story and the acting can carry a huge load over my suspension of disbelief. My prime example of this is "Brother from Another Planet". The two actors playing the hunters did a staggering job with their every move and blink to convince us they were reptile-based aliens in human suits. This site is an ongoing project to watch and review classic science fiction movies. New reviews are added roughly every week. I welcome comments, but this feature has to be moderated to stop spam. Please be patient.